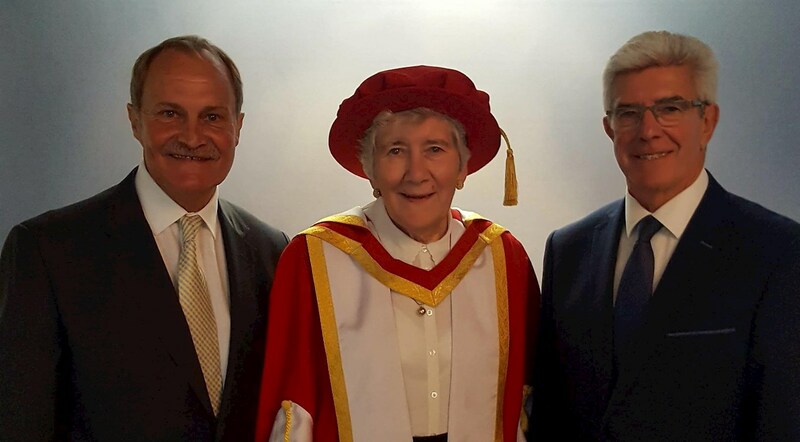 Pat Godbold, who worked for nine Town managers, has received an honorary doctorate from the University of Suffolk. Godbold joined the club in 1954 as then-boss Scott Duncan’s secretary and went on to work for every subsequent manager - Sir Alf Ramsey, Jackie Milburn, Bill McGarry, Sir Bobby Robson, Bobby Ferguson, John Duncan and John Lyall - until retiring from full-time work when George Burley was the man in the hotseat in 1997. Born in 1935, she continues to work at the club as archivist and is involved in the organisation of the annual ex-players’ dinner. 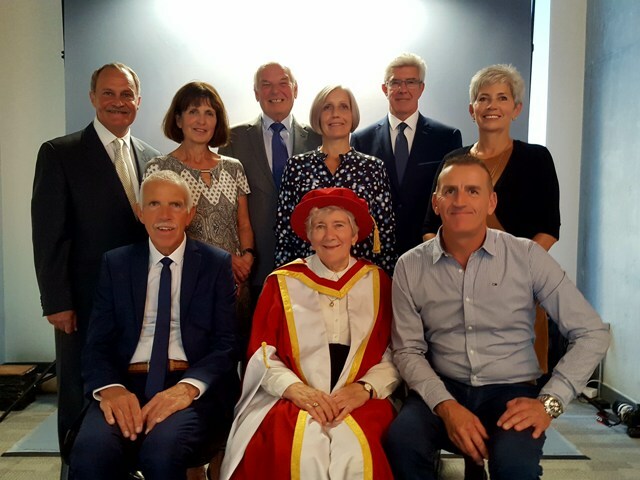 Godbold, who the FA awarded a medal for 50 years' loyal service to football in 2004, said of her doctorate: “I am amazed, very pleased and honoured. I was brought up in Ipswich on a council estate and left a Secondary Modern School [Nacton Road] with no qualifications. I am humbled. Blues legends Mick Mills and Bryan Hamilton, ex-Town chairman David Sheepshanks and former secretary David Rose were in attendance at today's graduation along with members of Godbold's family. Mills told the club site: “I’m very proud of Pat today. She took a job all those years ago that possibly, in her eyes, wasn’t going to be a very attractive job but then it became more than a job. In many respects, it was like head of a family and that is the role she took on. “She worked for some very famous managers, Sir Alf Ramsey and Sir Bobby Robson. She was there many, many years and literally took over looking after the young players that came to the club. Hamilton added: “I’ve known Pat for many years, a very long time, nearly 50 years. “She has been an amazing lady at the football club and certainly an amazing lady for the players. A wonderful woman that has our Club in her Heart. A well deserved award Pat for the loyalty and dedication alone. Well played. What a career. Imagine being the common denominator from Sir Alf thru to SBR. Many congratulations Pat. A TrueBlue if ever there was o e.
Honorary Degrees/Doctorates are often bestowed on ‘personalities’ or those known to the wider public. How imaginative and totally appropriate, therefore, for Pat to be recognised for her unstintig loyalty to and love of our Club - evidenced by her modesty and humility in accepting the richly deserved recognition. Her contribution over so many years is woven into the club’s fabric and history. So good for someone so ordinary, yet so very special, to have some time in the sun. What a wonderful way to recognise the contribution Pat has made to the club, and also to the town of Ipswich. Whilst working at the club, nothing was ever too much trouble for her. Bobby Robson was a lucky man to have Pat behind him. A really well-judged gesture from the new University, which we hope will be a major lasting asset to the town (and Town, perhaps). And nice to see Bryan and Sir Mick taking time to show up and join in. Is that David Rose at the back of the photo, next to Bryan? Sir George Burley - yes, that is David Rose between Mick and Bryan. A very well deserved accolade for Pat who has worked tirelessly for the club and is still involved, since starting an amazing 64 years ago! A proud moment for Pat. So good that she has received recognition for her contribution to the club, town and to football. Very well deserved. Pat was inducted to I.T.F.C. Hall of Fame in 2009, and quite rightly so.